We had a big old dying tree cut down, so we now have some sun in our yard! We are starting with one raised bed, and will probably add one a year until we run out of sunny areas. 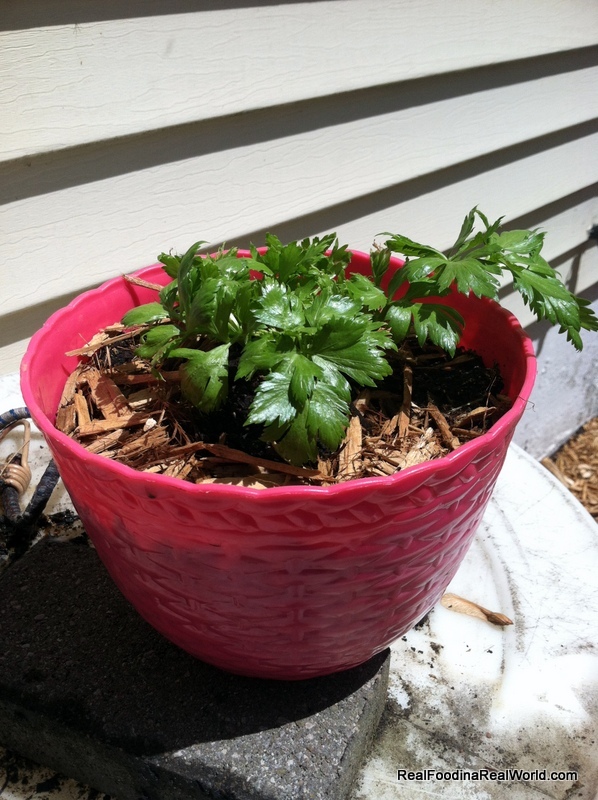 In the pink container (dollar store) is some celery I’m regrowing from the base of an organic celery bunch. Just cut the bottom off, place in water in a window and watch it grow! I let it sit in the window (just add water every other day) for 2 or 3 weeks before planting into the container. 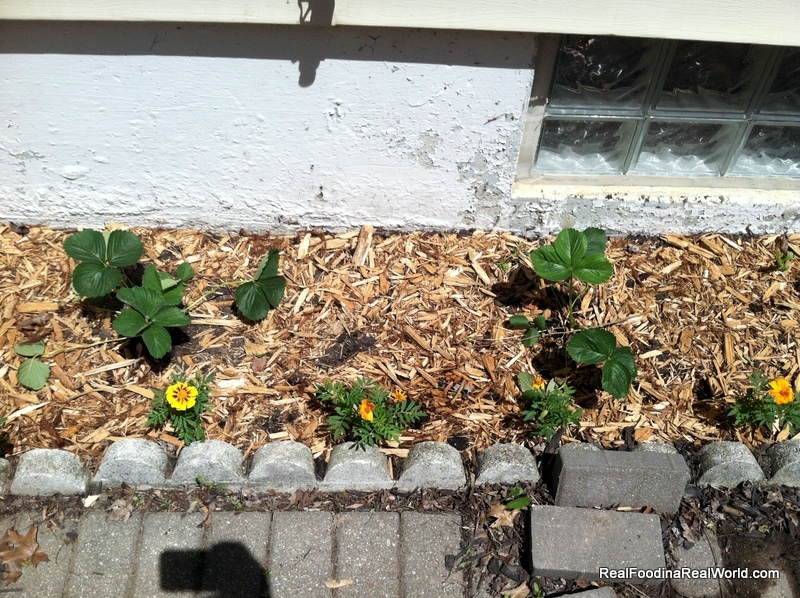 In the ground is two strawberry plants surrounded by marigolds. I think this will eventually need some protection from the critters, so I need to think up something. 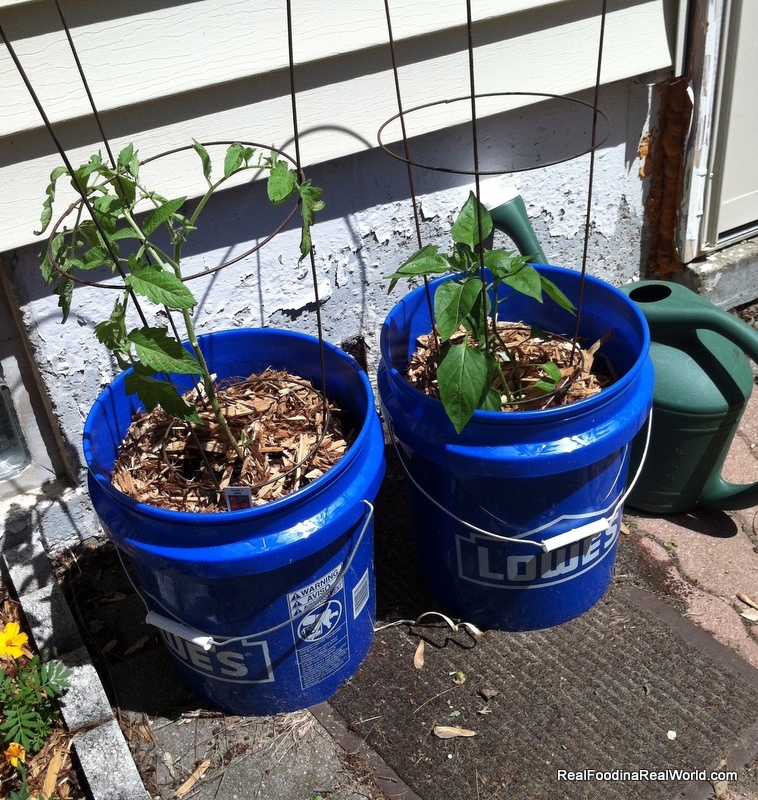 The two blue buckets are just five gallon buckets from Lowes. Local hubby drilled a zillion holes in the bottom, filled them with pea gravel we stole from local toddlers gravel pit, and then planted a tomato and a bell pepper. Local toddler was a big help this year, he did most of the dirt filling and planting. He’s also a fantastic waterer. Things I wanted to plant this year but didn’t get around to it: carrots, potatoes (I heard you can do them in a laundry basket, but you need straw) lettuce and some sort of leafy green (kale, chard, etc). I ran out of pots and sunny patches. 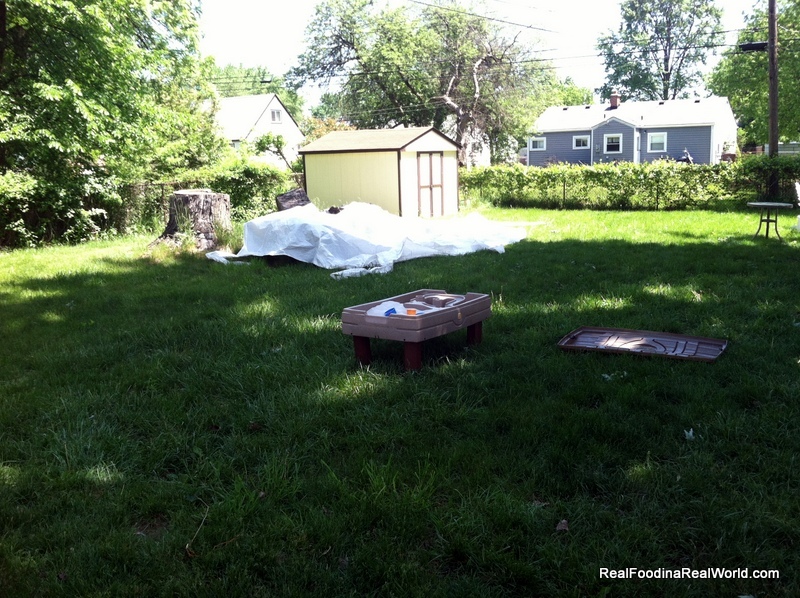 My hope with this post is to show you that anybody can grow their own food. You don’t need a lot of space, time or money. Even if you live in an apartment with no outdoor area, you can at least grow some herbs on your windowsill. Local toddler is having a blast tending to his plants, and he tells me the names of what he is watering. I picked up organic garden soil and organic fertilizer at Lowes, and my local hardware store. Go get your hands dirty! I can’t wait to pick my first produce and serve it to my family! “Anybody can grow their own food” we agree! 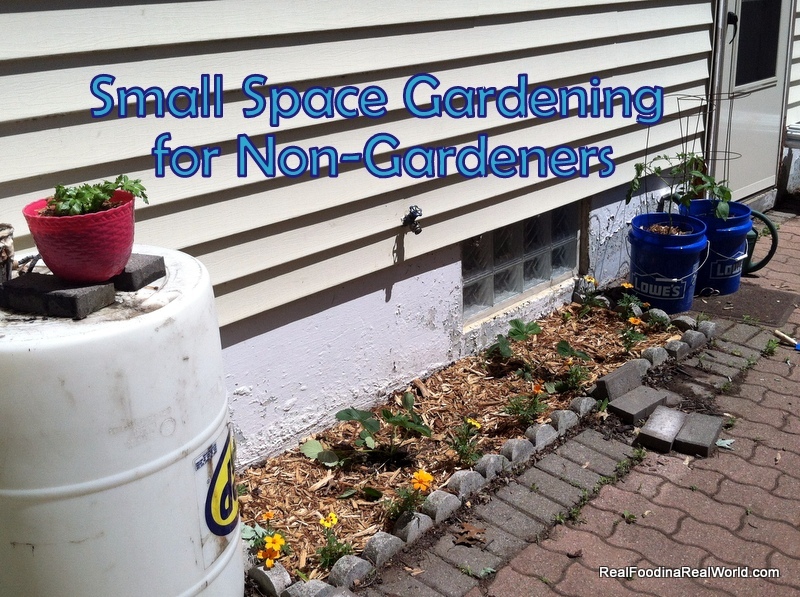 Great ideas for these little areas you are planting in and looking forward to your raised beds! Here’s a TED talk on the same subject: http://www.ted.com/talks/ron_finley_a_guerilla_gardener_in_south_central_la.html. We did a short brown bag topic on our blog about it if you and your readers are interested. Enjoy the strawberries, tomatoes and celery. Awesome! I actually found two more planters in our shed so I’m on my way to our local nursery center to see what else I should grow! I love a good TED talk, I look forward to watching it.